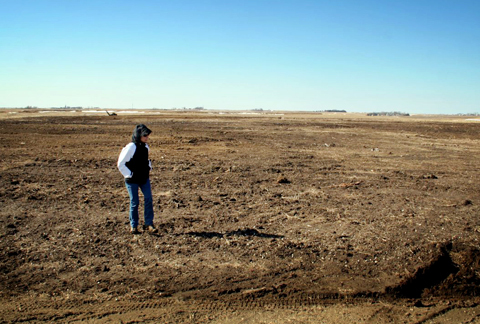 The 160-acre family farm is a thing of the past. While just 40 years ago, many square miles of the Iowa landscape were divided into farm quadrants, today’s family run farm is about 1,200 acres. As a young photojournalist in the early 1970s—a city kid from Baltimore who knew nothing about farming—I had an idea for a project to document the fast-approaching end of that small-farm, small town, one-room-schoolhouse era. Conveniently for me, my wife’s family owned a 160-acre farm near Tennant, Iowa—a tiny town about 30 miles east of Council Bluffs. Like others living in that four-family-per-square-mile world, theirs was a life of hard work and dedication to family and community, and I wanted to document the way things were then on the farm and in town. It was like an anthropology project: you knew it would never be there again, so you wanted to capture it as best you could. What you see here are some of the images that came out of that project. In November 2010, we sold the farm. Two months later, we came back to see the old place. The home and outbuildings documented in these images had already been completely razed and replaced by a cornfield.